Following the conclusion of the Lady Eagles’ 3-0 senior night victory over Chaparral on Tuesday, the crowd rose to its feet in admiration. It wasn’t for the way that the team had handled the visiting Cowboys but for the display of sportsmanship that was featured as senior team manager Aubrey Jorgensen took the court with the Lady Eagles’ starters for an exhibition match. Jorgensen, who has Down syndrome, has been with this group of seniors the past four years and has become quite the good luck charm for the Lady Eagles since her freshman season. 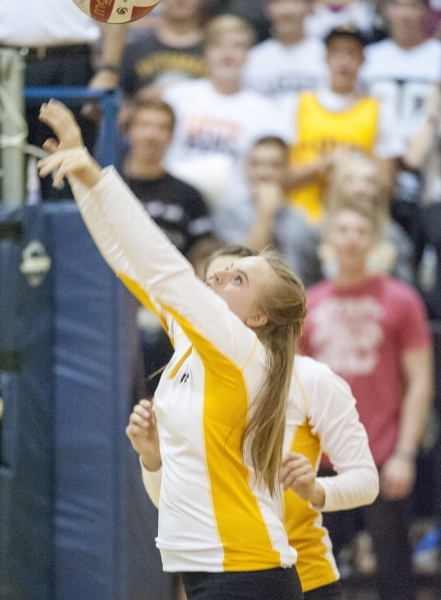 Despite falling 4-6 in the 10-point exhibition match to the Cowboys, the crowd, as well as her Lady Eagles teammates, lit up with excitement every time Jorgensen would make a play for the ball. Char Johnson, who was in the crowd to watch the game, said Jorgensen received a standing ovation as she walked onto the court. “Many (including myself) were crying at the touching sight. Aubrey hit several balls, high-fived teammates, and even did some endearing victory poses! Her few minutes of stardom made the whole audience smile,” she said. Despite being a bit timid with the spotlight being thrust upon her after her performance, it was easy to see the excitement glowing from the Lady Eagles’ newest middle blocker Tuesday night.